Most comic book characters look a bit silly when taken out of their usual context. That’s why a lot of superhero movies feel the need to insultingly wink at the audience and make a joke about someone looking goofy. It’s a way for the people making the movie to admit that they’re pandering to the character’s fans while also getting out in front of any hypothetical snotty audience members who have somehow missed the memo that superhero movies are pretty common these days. The reason this is relevant is because Marvel is making a movie with Benedict Cumberbatch about Doctor Strange, a character who even looks a bit silly when he’s in a comic book. Traditionally, he wears a blue tunic of some sort, with a giant golden amulet holding a red cape around his neck. The cape has a collar that extends at least as high as his head and then goes off in weird points. Also, his hair is going gray and he either has a carefully styled goatee or a long mustache. That’s not even getting into the fact that his real name is Doctor Stephen Strange, so that’s not a fancy moniker he picked up when he entered the world of superheroes. Now, Entertainment Weekly has released the first look at Cumberbatch in his full costume, and it seems safe to predict that a good chunk of the Doctor Strange movie will be spent justifying why he looks so silly. That’s not to say Cumberbatch looks bad as Strange, if anything he looks dangerously accurate to the comics—so, in other words, pretty silly. You can read a little bit about how Cumberbatch is still learning how to pretend he’s doing magic stuff in the link above, and you can see some more shots of him in the costume at this link. 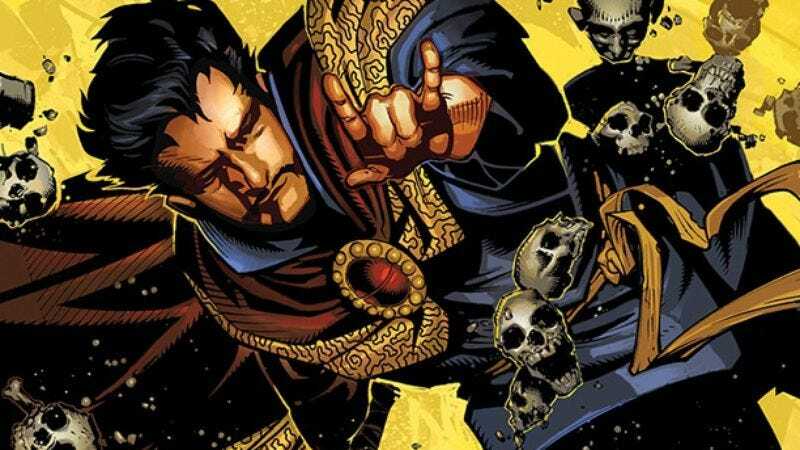 Doctor Strange will be in theaters on November 4 of next year.